As the summer approaches at Endsleigh the long border comes to the fore. All through the spring it has waited and watched as the wilder areas captivate visitors with their dazzling displays of wildflowers, bluebells, orchids, wild garlic, campion and all, knowing that soon its turn will come and as the spring wild flowers fade, it will be the belle of the ball. Already the Alliums, Asphedoline, Geraniums, Campanulas etc. are bursting forth and as we move into June they will be joined by Verbascum, ‘yellow’ hot pokers, Agapanthus, Tradescantia x andersonia hybrids, Anthemis tinctoria, Penstemon, Salvias, bearded irises to name but a few. Then of course there are the prima donnas in the form of Paeonies, fabulous but fleeting, one sometimes wonders why one gives them space given such a short flowering period, then they flower and all is forgiven. This is all set off against a froth of annuals such as Ammi majus with its white umbels and spreading perennials like Knautia macedonica and Gaura lindheimeri. The borders are not too tightly controlled and some self seeding is allowed, foxgloves and red campion creep in, but are (not too) ruthlessly culled before too much seed is dropped, annuals are also added to the gaps left by Camassias and the like, who annoyingly leave the party just as it is getting going. 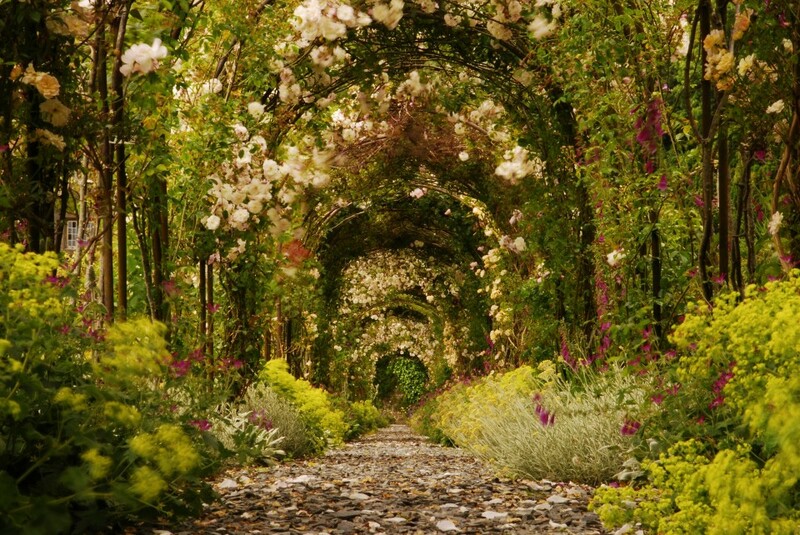 In the latter half of June and into July the Rose Walk takes centre stage. To the rear of the long border, a hundred metre long arch bedecked in scented roses offers a sensory overload, and once again the hours of pruning and cosseting are forgiven as the heady scent and plethora of blooms attracts admiration from all. The parterre will be stripped at the beginning of June which always seems rather ungrateful, as the wallflowers will still be valiantly flowering away. This year it will be filled with some 2000 Salvia harmonium for the summer display, this fits very well with Repton’s original intention for the parterre as a children’s playground, as the salvia will soon outgrow small children and turn the whole parterre into a miniature maze. Add to that the fountain, rills and lions’ heads and there are hours of fun to be had, of course for the more mature visitor it is also the perfect spot for a long lazy breakfast or afternoon tea. During the summer months the dell undergoes a transformation from picturesque English valley to seething jungle as the gunnera turns the open walks at the bottom of the valley into ominous tunnels for the adventurous guest to explore, its huge and somewhat menacing leaves tower over the paths, blocking out the sun, the garden staff have to patrol with machetes in hand to keep the paths open, the picture is very different to that of the spring. At this time of year the rills, cascades and waterfalls have to be carefully managed to keep them all flowing and I get to relive my childhood as I leap into the stream to build a dam here or divert a channel there. We have recently cleared a cascade on the east side of the dell and have unearthed a set of steps and walkway through it, which again ignites my childish curiosity. We hope to reinstate the path at some point when we have more detailed evidence, so that we can do it sympathetically to the original plans and have already started to replant the area with primulas and other moisture loving plants. The collection of some thousand plants looked huge in our yard but now in situ looks sadly insignificant, they’ll increase in time and we’ll grow on some more for next year. 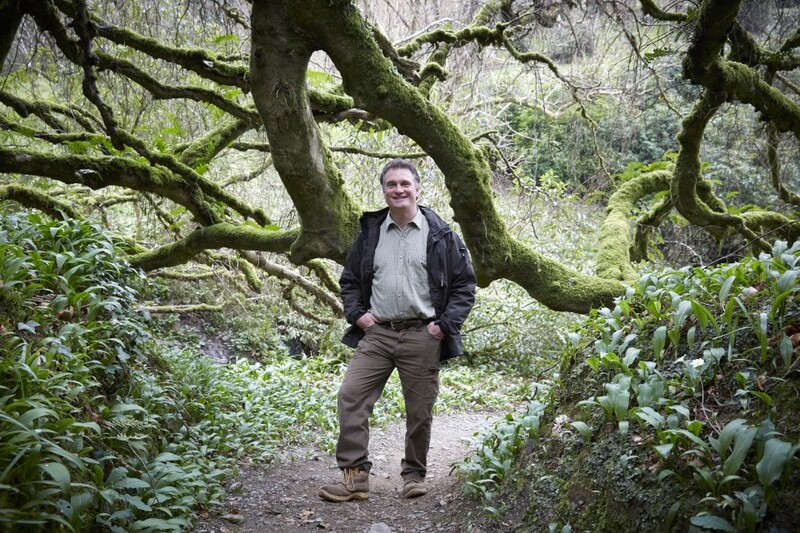 As people keep reminding me there’s more than one lifetime’s work in the gardens at Endsleigh. Book a two-night stay or longer with code ROSES this summer and you’ll be given a tour of the gardens with head gardener Ben Ruscombe-King.